Workshop organisé par Catherine Jami (CECMC), Mandkhai Lkhagvasuren (University of Tokyo/GHC), et Antonella Romano (CAK/GHC). 18 mai 2016, 9h-18h30, EHESS, 190 Av. de France, salle 15, rdc. This workshop aims at discussing how knowledge and techniques related to empire building developed through exchanges of experience and models, as well as individual mobility. The area under consideration is Eurasia from the “age of Mongol expansion” to the 18th c.
Papers will be presented by scholars belonging to different fields of expertise and at different stages of their careers. 9h45. Keynote: Nicola di Cosmo (Institute for Advanced Studies, Princeton), Connections between the early modern world and the Manchu conquest of China: building a circumstantial case. 11h. Mandkhai Lkhagvasuren (Université de Tokyo/GHC), Reexamination of Mongol administration: the case of ulugh- bitigchi in Iran. 11h45. Etienne de la Vaissière (CETOBAC), Pre-Mongol but Post-Sneath: Steppic governmental knowledges on the Longue Durée. 14h. Thomas Tanase (UMR 8167 “Orient et Méditerranée”), The Discovery of a greater Asia: a drive to the expansion (13th-15th centuries). 14h45. Antonella Romano (CAK/GHC), Comparing “Chinese” and “Manchus” in European sources of the early modern period. 15h30. 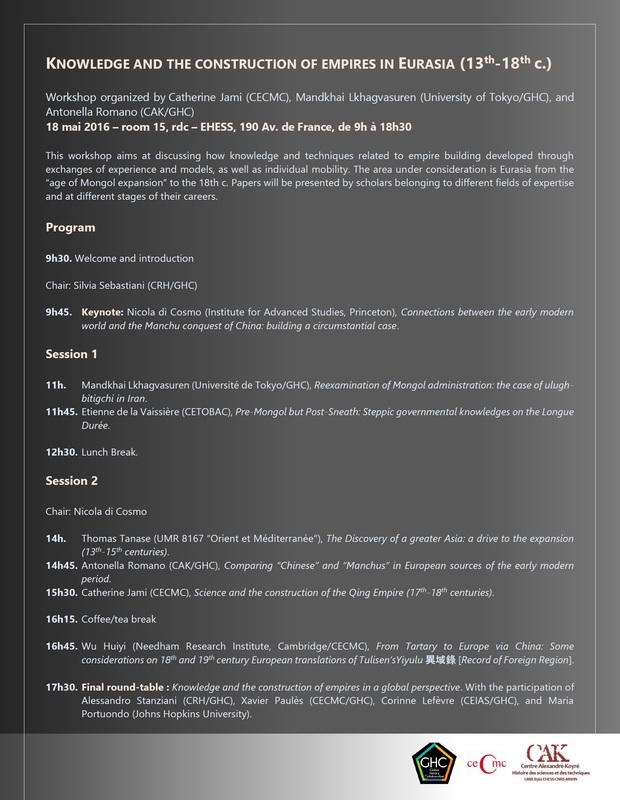 Catherine Jami (CECMC), Science and the construction of the Qing Empire (17th-18th centuries). 16h45. Wu Huiyi (Needham Research Institute, Cambridge/ CECMC), From Tartary to Europe via China: Some considerations on 18th and 19th century European translations of Tulisen’sYiyulu 異域錄[Record of Foreign Region]. 17h30. Final round-table : Knowledge and the construction of empires in a global perspective. With the participation of Alessandro Stanziani (CRH/GHC), Xavier Paulès (CECMC/GHC), Corinne Lefèvre (CEIAS/GHC), and Maria Portuondo (Johns Hopkins University).